Joe Dorish Sports: Why Does the Media and PGA Keep Downplaying Jordan Spieth's Greatness? In a way, Jordan Spieth is the Rodney Dangerfield of golf because whatever he does he can't get any respect from the media and the PGA. Jordan Spieth just won his third career major at the 2017 British Open but the media and the PGA treat him like he's just any other star golfer on tour. Jordan Spieth is not just any other star golfer on tour. What he's doing at his age is pretty remarkable and he's already so far outpaced any of his contemporaries on tour it's a joke they should even be compared to him but they are over and over by the media and especially the golfing media. Here's just a few examples of the lack of respect afforded to Jordan Spieth. At one of the golf majors last year, Jim Nance kept going on and on talking about how well some of the amateurs were doing in the tournament. The problem with that was that every single one of the amateurs Nance was crowing about was older than Jordan Spieth who had already won two majors at that point. Why sit there and croon about a bunch of amateurs who were all older than Jordan Spieth and will never go on to accomplish much in golf when Jordan Spieth is already sitting right in front of you? Nance never once pointed out that Jordan Spieth had already accomplished more than any of those amateurs ever will and he's younger than they are to boot! If you just watched the 2017 British Open and sat through all the commercials you already know you saw Rickie Fowler's face about 100 times more than Jordan Spieth's because Fowler was in every other ad shown on the broadcast. That's despite the fact that Rickie Fowler is five years older than Jordan Spieth and he's never won a major and only has four total wins on the PGA Tour. Jordan Spieth now has 11 wins on the PGA Tour including three of the four majors in golf. 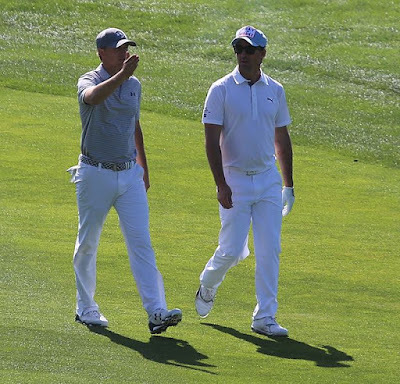 What does Spieth have to do to get the same respect as Rickie Fowler? Jim Nance is again guilty here. Nance does not do this as much as he used to but for a couple of years he would gush unabashedly telling everyone how great Rickie Fowler is. Rickie Fowler has yet to win a golf major but he does have two second place finishes and a third place finish in majors. Guess what? In addition to his three golf major wins, Jordan Spieth has already come in 2nd place at three other majors! Seriously, what does Jordan Spieth have to do to get his face plastered all over the commercials in golf like Rickie Fowler and have Jim Nance gush about how great he is? The press has finally cooled off a bit with Jason Day but for the last few years all you heard was how great a golfer Day is. And Jason Day did win the PGA Championship in 2015 for his first golf major win. But Jason Day is six years older than Jordan Spieth and will likely never come close to accomplishing what Jordan Speith already has. Spieth has already won 11 times on tour compared to 10 times for Day and Spieth has three times the major wins too. Dustin Johnson is nine years older than Jordan Spieth and he has won 15 times on tour including one major and he's engaged to hockey legend Wayne Gretzky's beautiful daughter Paulina and has two kids with her. Add all that up and it's not that surprising that DJ gets at least as much press time as Jordan Spieth does, but again, Jordan Spieth already deserves way more respect than Dustin Johnson does. How many wins on tour and how many golf major wins will Jordan Spieth have nine years from now when he is 33, the same age as Dustin Johnson is now? If you think about that you can clearly see why Jordan Spieth deserves far more respect from the media and the PGA than Dustin Johnson does but up until now DJ has gotten far more press than Jordan Spieth. Maybe it's because Jordan Spieth is a humble guy or maybe it has to do with his Masters meltdown in 2016, but for whatever reason up until this point in his career Jordan Spieth has not gotten the respect that his accomplishments on the golf course deserve. So to Jim Nance and the rest of the media and the PGA wake-up and recognize real greatness when you see it.